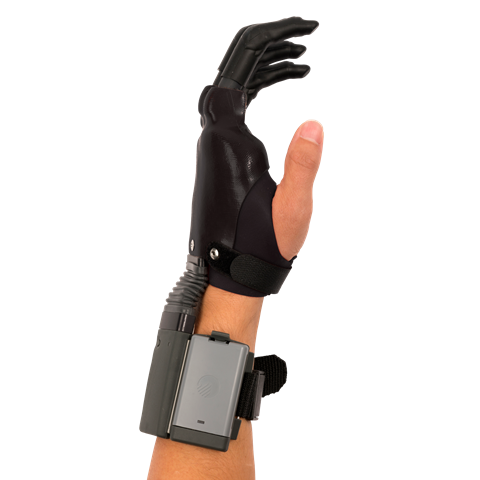 i-Digits™ Access is a customized prosthetic device for individuals with partial hand loss or deficiency. i-Digits Access is appropriate for partial hand absence. Suitable candidates present with partial hand loss where the level of loss or deficiency is distal to the wrist and proximal of the metacarpophalangeal joint. Anywhere from one to five digits can be replaced. i-Digits Access offers a functional partial hand solution. i-digits™ are available in extra small and medium sizes. The extra small mounting plate is 67 mm wide, with a straight digit alignment. The medium mounting plate is 73 mm wide, with a splayed digit alignment. These configurations provide the optimal digit arrangement and functionality for individuals within the advised fitting guidelines. A range of input options are available for i-digits™ allowing the optimum option for the individual user to be utilized. Low profile gold domes, conform well to the shaping of the residual hand for improved comfort. Suspension piece is fabricated within the silicone socket. This provides the optimum suspension and spacing of the electrode domes. Two domes are positioned together for the muscle site, and one single shared ground dome can be used for dual site control. Very thin touch pad which the user physically moves a part of their residual hand against the pad. Most useful when a short finger remnant is present.